As in the previous collaborative projects, one of our main goals is to contribute to the formation of the next generation of breeders. 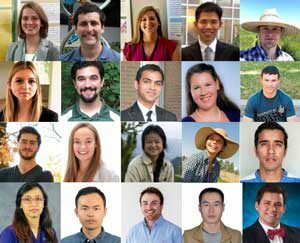 Here you can meet the WheatCAP graduate students and postdocs and learn about their lines of research. The Plant Breeding Training Network (PBTN) is a platform for sharing breeding related educational materials (videos, webinars, on-line courses). PBTN was built on infrastructure funded by NSF and it was created as part of our previous collaborative project, TriticeaeCAP. Now we continue supporting it through WheatCAP. We organized a workshop about wheat transcriptomics that covered different subjects such as RNA-Seq library construction protocols, using bioinformatics pipelines and network analysis of RNA-Seq data. We are making publicly available the recordings of the lectures, slides and protocols here. Also in 2018 we designed an on-line training activity to teach how to work with the wheat module of the Triticeae Toolbox (T3). The T3/wheat is a rich repository for public wheat data maintained by the WheatCAP. The on-line course includes video lectures, tutorials on how to use R to process T3 data in a reproducible manner, detection of variants and use of linux. In 2018 we repeated the Annual Graduate Student Survey, a summary of the results is shown here.